^ Pop/Rock » Rock & Roll/Roots » Latin Rock. AllMusic. All Media Network. [October 28, 2016]. ^ Mojo. Irvin, Jim, 编. The Mojo Collection: The Ultimate Music Companion 4th. Canongate Books. 2007: 213. ISBN 978-1-8419-5973-3. ^ Strong, Martin Charles; Griffin, Brendon. Lights, camera, sound tracks. Canongate. 2008: 525. ISBN 978-1-84767-003-8. ^ Fletcher, Amy L. Acid Rock. (编) Debolt, Abbe A.; Baugess, James S. The Guide to United States Popular Culture 1: A–M. Popular Press. 2012: 7–8. ISBN 978-0-313-32944-9. ^ Pacini Hernández, Deborah. A Tale of Two Cities: A Comparative Analysis of Los Angeles Chicano and Nuyorican Engagement with Rock and Roll. Centro Journal. Spring 2000, 11 (2): 79. ^ Steven Joseph Loza. Tito Puente and the Making of Latin Music. University of Illinois Press. 1999: 16. ISBN 9780252067785. ^ Louise Chipley Slavicek. Carlos Santana. Infobase Publishing. 2006: 77. ISBN 9781438106724. ^ 1999 Grammy Award Winners. Grammy.com. [1 May 2011]. 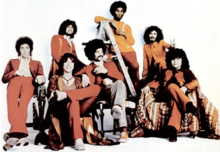 ultimateclassicrock.com "Carlos Santana Reuniting Original Group"